The first Wesleyan Sunday School in Egerton was built in 1837 on Water Street. On Jan 31st, 1847 a teachers’ meeting was held at Birtenshaw Chapel at which Mr J Chadwick, Superintendent of Egerton School, said, ‘The Egerton School at present is in a low condition. Last Sunday we only had three teachers besides myself. Once we had 150 scholars, now we have only 60. Many scholars leave because we have no regular teachers. We would be glad of help’. Robert Topping, a stalwart at Birtenshaw replied: ‘Egerton is a branch school from Birtenshaw; we ought to assist and nurse it if at all possible’. 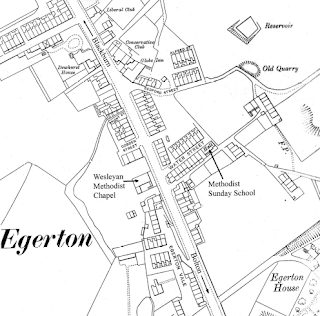 Four volunteers then offered themselves which helped Egerton for many years. Some Egerton School Superintendents were elected at meetings held at Birtenshaw, and ministers and workers at both chapels assisted each other, particularly in social and temperance work. The Methodists vacated their Water Street premises in December 1892 and they were sold to the Oddfellows and Foresters Friendly Societies. The societies agreed to pay half the cost of transfer. 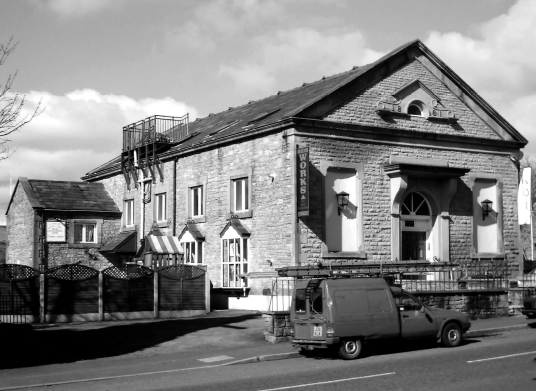 The premises were later demolished to make way for building the Egerton Swimming Baths. The converted Egerton Wesleyan Chapel building: 2005. Your proposals have been laid before the exors. of the late E Ashworth. Considering that you wish to purchase the land for a place of Worship, they will accept 3/- per yard (square) the halves of adjoining streets being measured to you, and subject to such conditions of deed as their solicitors may find necessary. The plans of the building we should like to see. Messrs Ashworth were requested to convey the land free of law charges. The contract for building was given to Henry Wardle & Co, Darwen who quoted the lowest tender. Building started but the firm went bankrupt before completion and the work was held up. The chapel was completed by the creditors in 1891 and included in the Bolton Bridge Street Circuit. There was one school hall, three other rooms and a chapel with pews for seating for 186 people. The list of Chapel Trustees at the beginning of the 1892 minute book includes: J Rostron, A Brook, Sam C Brook, J Halliday, S Taylor, J Yates, A Entwistle, R Ward, W Greenhalgh, G W Walker, G Marsden, R Whittle, J Whittle, B S Thornton; fourteen in all. The chapel was registered as a place of worship on August 19th, 1892. The possibility of organising a 10-day mission conducted by a Cliff College evangelist was considered by a meeting held on October 4th, 1909 when the Rev’d E C Harris occupied the Chair. The matter of Sunday evening preaching was discussed in October 1911 with a view towards improving attendance. A discussion about the distribution and recipients of the Lomax Charity took place during business at the November, 1912 meeting. It was reported at a meeting held on January 30th, 1913 that a park was in the course of formation and resolved that allowance be granted to remove soil adjoining the chapel free of charge. 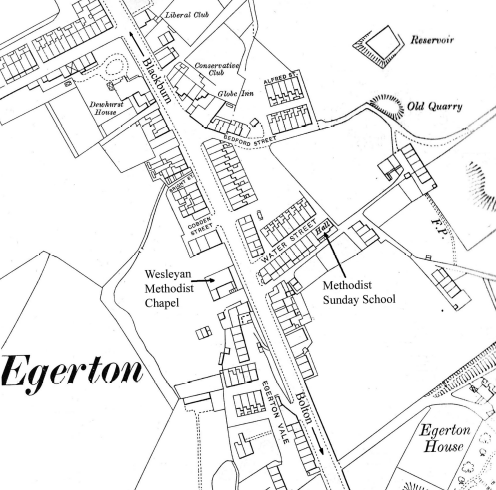 Location of the chapel and Sunday School in Egerton: 1908. Damage to the chapel rails by a horse and trap was discussed at a meeting held on October 18th, 1927. It was resolved that the rails be properly repaired at the expense of Mr John Oddie, farmer of Critchley Fold Farm, he being responsible for the damage. For many years, Thomas Middleton, a Chapel Trustee and engineer at the nearby Deakins Mill, ‘patched-up’ the heating boiler to keep it working and keep the place warm, but in the end the boiler failed and a replacement proved too costly. Falling numbers of worshippers in the then small Egerton community and increasing maintenance costs, caused the chapel to close in 1963 after around 70 years of use. The structure is now used as residential apartments, but continues to proudly display its original date stone, 1891 in large numerals on the front facade.